Heat the milk, but don’t let it simmer. Tear pieces of the white bread into it and let it soak for 5 minutes, before picking it up with your hand, squeezing it of excess milk and putting it in a large mixing bowl. Add the pork, garlic, parsley, grated cheese, egg, salt, and pepper. Combine all the ingredients with a fork until they are evenly mixed. Pinch off a small lump of meat, about the size of a raspberry and roll the lump into a ball in the palm of your hands. When all the meatballs have been shaped , roll them in the flour, 15 to 20 at a time. Place the floured meatballs in a strainer and shake it smartly to dispose of excess flour. Put enough vegetable oil in a skillet to rise 1/4-inch up the sides of the pan and turn on the heat to medium high. 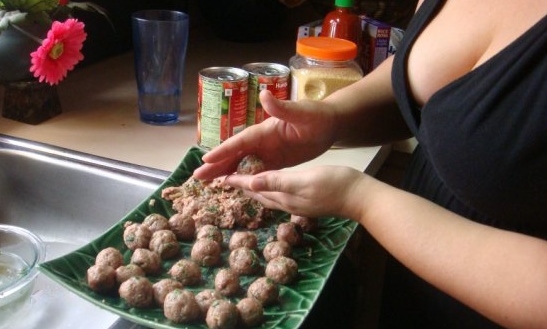 When the oil is hot, put as many meatballs in the skillet as will fit without overcrowding. Brown them until they form a nice crust all around. When one batch is done, transfer it with a slotted spoon to a platter covered with paper towels to drain and do the next batch until all are done. Heat the milk over low heat in a saucepan until it forms a ring of pearly bubbles, but do not let it break into a boil. In a larger saucepan, melt the butter over low heat, add the flour and stirring constantly with a wooden spoon or flat whisk until combined. Add 2 tablespoons of milk at a time to the flour and butter mixture, stirring steadily and thoroughly, then repeat through 8 additions. At this point, you can add the milk in 1/2 cup increments, stirring constantly to keep it smooth. Add the salt, pepper and nutmeg and stir the sauce until it thickens. 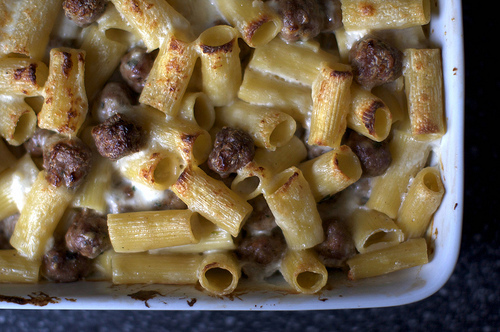 Cook the rigatoni in a pot of well salted water. Drain when still al dente, and combine immediately in bowl with two-thirds of the bèchamel, half the grated cheese, and all the meatballs. Preheat the oven to 400°F. Heavily butter a 9×13 baking dish. Spread the rigatoni and meatball mixture in the pan, leveling it off with a spatula. Pour the milk over the dish, then spread the rest of bèchamel on top, and sprinkle with the remaining grated cheese. Place in the uppermost level of the preheated oven. Bake for 15 to 20 minutes until a golden brown crust forms on top.